The Southwest Through Wide Brown Eyes: Wolfman Panel and Ruins - Comb Ridge, Part One. Wolfman Panel and Ruins - Comb Ridge, Part One. Comb Ridge; depending on the book you're reading ("Comb Ridge and its People" by Robert S. McPherson), or one of the many websites/blogs, about it, is 80 to 120 miles long from the base of the Abajo Mountains on the Blanding side to Kayenta, Arizona. A monocline (step-like fold in rock strata consisting of a steeper dip within a horizontal or gently-dipping sequence) which, from a bird's eye view, resembles the teeth of a comb. In the Navajo language, it translates to "Rock Extends in the Form of a Narrow Edge"; to the Mormon pioneers of 1880, it was another obstacle on their trek to settle along the San Juan River in an area they named "Bluff". San Juan Couty Route 262 (Lower Butler Wash) is 21 miles long and extends between State Highway 95 (south of Blanding) to State Highway 163 (about 9 miles southwest of Bluff). 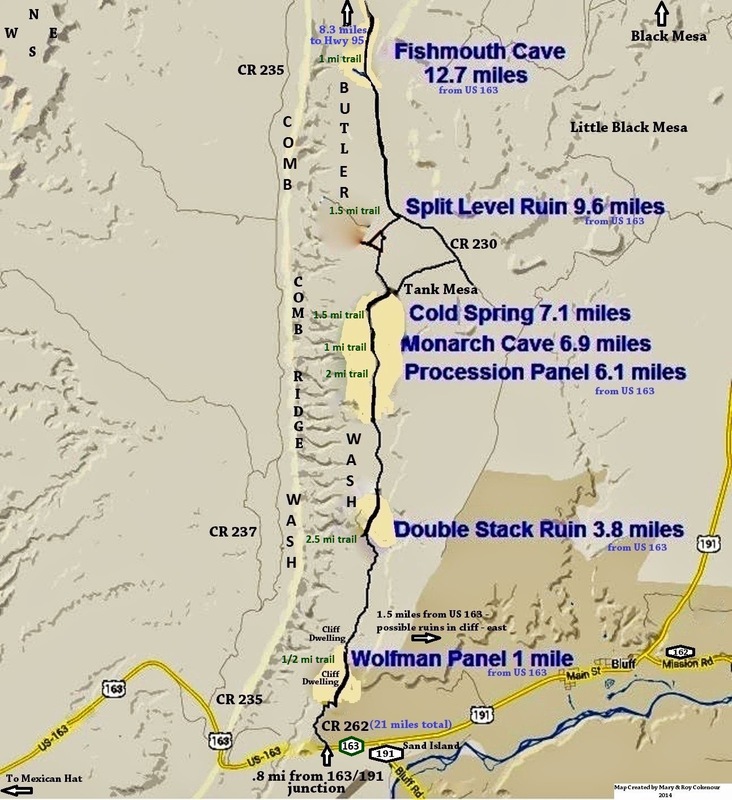 There are seven major points of interest along this route containing ruins and/or rock art; hiking, climbing and camping are side benefits...NO ATVs allowed past Butler Wash as you travel west towards the Ridge. Map time! If you don't like my map, let me recommend "Utah Anasazi Canyons - Cedar Mesa/Comb Ridge - 2014 Canyon Atlas" by Joe Berardi; even though they're topographic like maps, there is a lot of detail that made it so easy to navigate the area. Roy and I spent about 9 hours along CR 262 divided between hiking, climbing, picnic lunch, trying to figure out where the trails are (it's BLM land and almost NO signs to help you figure out where you are). If you don't buy the book I recommended, you will be thanking me for the semi-homemade map above; definitely use your odometer for this trip to figure out where the trails are exactly. We chose to start at the Bluff end of CR 262. "Why? ", you ask? Simple reason, we wanted to stop at Bluff Fort and pick up some of the made fresh daily cookies/brownies to add to our picnic lunch. Taking almost two hundred photos of our journey, it's best that I divide up the story; starting with the Wolfman Panel and Ruins; two hours were spent just there! One guide book describes the hike to the panel and ruins as "short, easy and interesting"; the "interesting" part was the most truthful of the description. I'm getting ahead of myself, first I should tell you how to find CR 262 from Bluff. As you leave the main section of Bluff, you'll go about nine miles to the junction where Route 191 turns south towards Arizona; Route 163 takes over to lead you towards Mexican Hat and Monument Valley. 8/10ths of a mile further along Route 163, there will be a closed cattle gate, the sign for CR 262 just beyond it; set the odometer to zero, open the gate, go through and re-close the gate. Almost immediately there will be a split, go left; oh yeah, the road is completely dirt, rocks, potholes, small to large crevices created by flash flooding, twisty, sharp inclines and declines...four wheel drive is the must! At the second split in the road, go right; from Route 163 you need to travel one mile to the Wolfman Panel trail, so hope you set your odometer at the gate. At one mile there will be a cattle guard and a road will go out to the left, towards the Ridge; take that left hand trail. It's only about 1/10th of a mile before you come to a parking area; get ready to hoof it from there; bring water! Now here comes that short, easy hike....yeah, right. From the posts (see above photo), if you walk in a northwesterly direction over the slickrock, you will quickly notice a cave; keep going for there are ruins there. The dry wash that is between where you are standing and the ruins is Butler Wash; this will run parallel to CR 262 all the way up to State Highway 95. Now comes the real "fun", finding the Wolfman Panel and Ruins. Turn south and begin walking over the slickrock; eventually you will see two sets of cairns (small stones piled atop each other) next to each other; begin walking downward towards the dry wash and then parallel to it. When we were there, someone/thing had knocked down a good many of the cairns, so our good deed was to re-stack them to mark the trail to the rock art and ruins. ...and then you'll see the trail itself. WARNING: If you are claustrophobic and/or afraid of heights, this may not be a hike for you. There will be sections where you will either have to squeeze between large boulders and the rock wall, or climb down over large boulders to a steep, rock strewn ledge. When you get to the cave (evidence of it being used for camping), the ledge you need to walk gets even more narrow and tilts to a forty-five degree angle, downwards towards the dry wash.
Ranchers used this section as their personal shooting range. Across from the Panel is another large cave; at first we thought this was the ruin site, but it is just sandstone and dirt that has been formed into interesting shapes by the weather. There is a good number of these caves all through Butler Wash and Comb Ridge. The Wolfman Ruins are further south from the Panel; you have to climb down into the dry wash ( a steep descent) walk along the wash until you see the remains of a beaver dam; walk over that to a steep ascent and the ruins should be a little further south from there. It's about a half mile trek...we didn't do it, simply too exhausted after the "short, easy" hike to the Panel and we still had to get back to the SUV! We do plan on going back and accomplishing this trek to the Wolfman Ruins though; we'll be better prepared. So now I only have to go through the remaining 100 photos of the rest of CR 262, and then I can write up the other parts of Comb Ridge. Oh, there is camping all along Butler Wash, some spots are tree lined, shady and quite lovely. Your pictures are great. That whole area was awesome (and hot at 90F in late Sept when I was there). To stand there and realized what you can still see clearly is from people and time hundreds to thousand years ago. The disturbing part (not seen in the photos) is the damage/graffiti perpetrated recently (past 50 years) by vandals on works that have survived weathering for so long. The Sand Island walls are a sad example. For those of us who had the privileged of experiencing the ruins we need to push to preserve them too. Hi Phil, I'm glad you enjoyed my photos and write up. I also enjoyed looking at your photos and video; now I'm itching to get back out there! Thank you for posting! We did this hike 25 years ago and I'm planning a father-son re visit this spring. You're welcome. Please stop by the Discovery Center when you come back and say Hi! Cisco, a Ghost Town of Grand County, Utah.